This post is sponsored by A Fresh Look but the content and opinions expressed here are my own. First, let’s take a fresh look at GMOs since the chocolates I will be sharing are made with the help of GMO farming which uses less water, less energy use, and fewer pesticides! GMO means Genetically Modified Organisms, most of what we eat today have GMOs! Scientists started to GM food because of diseases and to help with drought conditions. For instance, corn is one of the most genetically modified food, which means food that contains corn in it probably contains GMOs. If you don’t always buy certified organic or non-GMO products then you are more than likely eating food with GMOs! It’s up to the individual if they like GMOs or non-GMO products. Now that I shared a little bit about GMOs, let’s check Ethos chocolates! 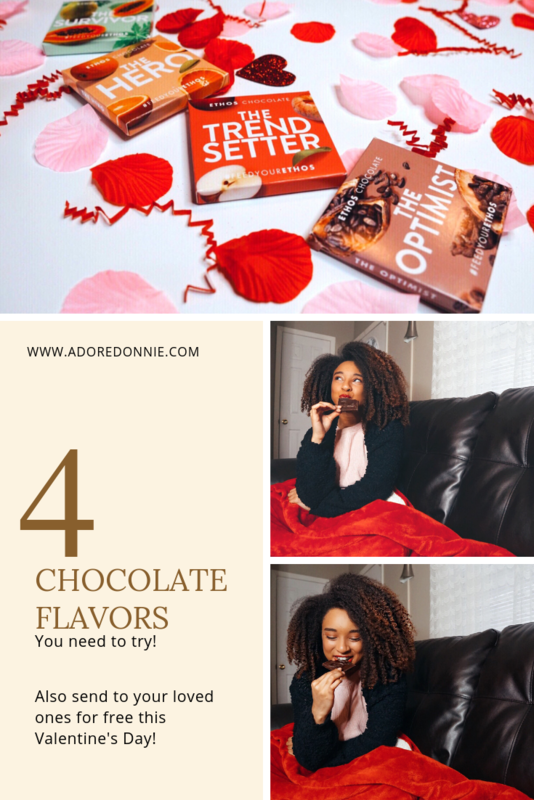 These chocolates are super rich in flavor, if you or your loved ones love rich tasting chocolates then you’ll love this chocolate. The first flavor I want to introduce you guys to is The Optimist, it’s one of my favorites! The optimist flavor is the cacao bean. Did you recently hear that due to climate change and diseases, that the cacao trees are dying? I know right, that’s pretty sad! However, GMO farming can protect cacao trees! This bar of chocolate is actually made from the cacao trees in the Dominican Republic! The next flavor I want to share is The Trendsetter, which is made with apple. It’s something I’ve never tasted before, it’s super sweet but the apple gives it a tangy twist! GMO farming helps apples stay fresh longer, which helps cuts down on food waste. Another favorite of mine is The Survivor, which has papaya in it. The rich chocolate with the papaya has a very subtle sweetness to it! It’s very different from the Trendsetter because the apple flavor sneaks up on you and wows you! Did you know a virus, known as the Papa Ring Spot Virus(PRSV) nearly wiped out Hawaii’s Rainbow papaya in the early 2000s? If not, I guess you didn’t know that GMOs also helped papayas come back! From my research, it’s actually one of the first GM fruits! The last chocolate is The Hero, made with orange. This chocolate hits you with a ray of sunshine, not even kidding! Who knew chocolate and orange works well together! This is actually my love’s favorite out of all them! Did you know that citrus greening disease or yellow dragon disease is threatening the Oranges in Florida? GMOs might be able to help oranges fight these diseases like how the papaya fought the PRSV with the help of farmers! Ethos chocolates would be sweet gifts to give on Valentine’s day! Mainly because they’re not the same chocolate that people always give and/or receive, you should always switch it up from time to time! Additionally, while sharing a little love, you can also share some facts about GMOs! It will help get the conversation started and people can help educate themselves about GMO products. Send the chocolates to family or friends for free before 2/10/19 for delivery on Valentine’s Day www.ethos-chocolate.com/yoursfree! Thanks for reading and ta-ta for now!